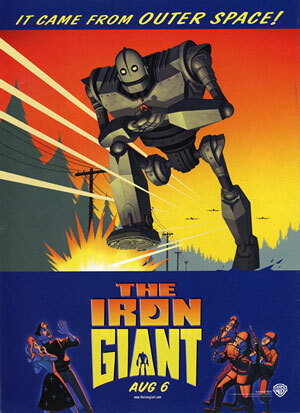 The Iron Giant is an animated sci-fi film about an ordinary boy, Hogarth Hughes, who met a 50-foot-tall robot from the outer space. They became good friends and learned a lot of things from each other. The alien robot was originally made to destroy humanity but because of the impact made by his crashing on earth, his memories were gone. So instead of being a weapon to kill, he was regarded as a hero when he stopped a nuclear missile to land and destroy the whole town into dust. He chose to be a “Superman” rather than to be a villain. I personally like this animated movie because it portrayed about the possibility of a common individual to be friends with a robot. It was released in 1999 and I think, people, many years before that, already have this idea that one day, we will have to interact with robots. Many developed countries are now devising an AI robot. I don’t know if their purpose is just for the advancement of technology or to be ready just in case there would be another war. I just hope that these robots, like the Iron Giant, whether he is programmed to destroy or not, would have the choice to be what it wanted to be. This entry was posted in Random Million and tagged animation, movie, movie review, robot. Bookmark the permalink.